Happy Earth Day! If you are vacationing on Aruba, join us today at Divi Phoenix for our Earth Day Beach Cleanup starting at 7:30pm. We will also be planting some trees around the resort. Happy Earth Day Week! 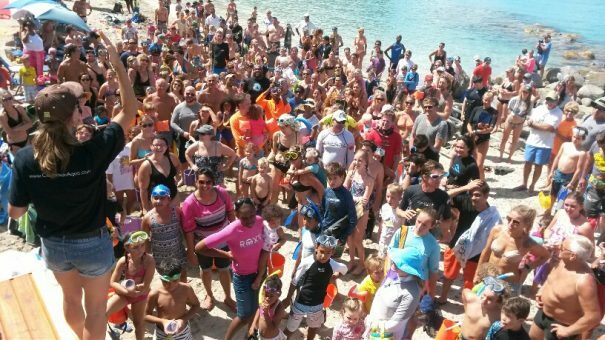 Did you know that all of the proceeds from our Underwater Easter Egg Hunt at Divi Little Bay went to the Nature Foundation? We had a great turn out as we had over 220+ participants at the event. We’d like to thank to everyone who helped make the event such a success! See you again next Easter! 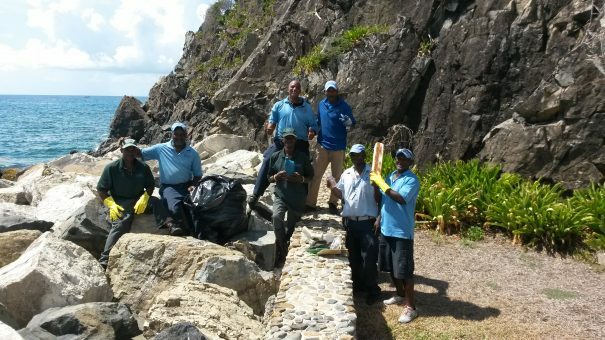 Divi Little Bay Beach Resort is Blue Flag certified! Happy Earth Day Week! 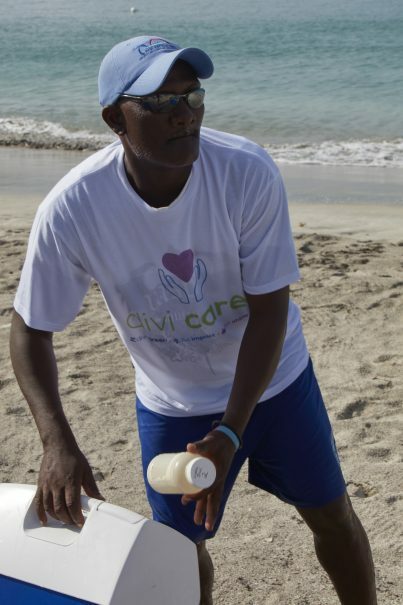 Did you know that we test the water in front of Divi Little Bay Beach Resort every day to keep our Blue Flag eco-label? Divi Little Bay Beach Resort is Blue Flag certified, meaning they meet the Foundation for Environmental Education’s high standards for water quality, safety, environmental education and information. Happy Earth Day Week! 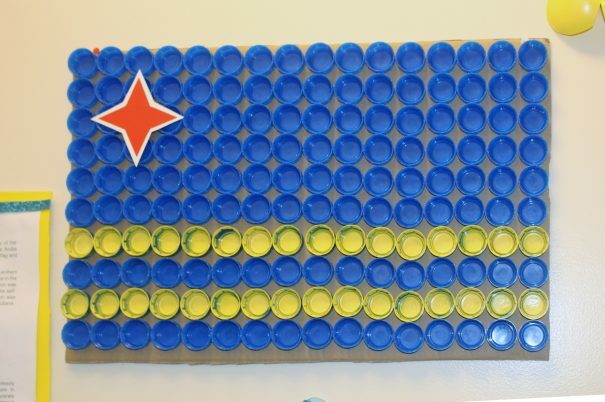 Check out our recycled bottle cap Aruban flag. Divi Aruba Phoenix Beach Resort decorated for National Flag and Anthem Day this year using only recycled material. Divi Flamingo’s Adopted Sea Turtle Nest on Bonaire! As a 2016 sponsor of Sea Turtle Conservation Bonaire’s Adopt a Sea Turtle program, the money donated by Divi Flamingo Beach Resort & Casino will help STCB to protect a specific nest’s eggs from drowning if water floods the nest area, and to help release any newborn turtles that become trapped underground during hatching. The donation will also support the popular Beechkeepers Program, a volunteer network that works with STCB to collect information about the status of Bonaire’s sea turtle populations, so that nests can be protected more efficiently in the future. In 2015, seven STCB sponsored nests helped 693 baby hatchlings make it to sea safely. Bonaire is home to three of the world’s six species of endangered or critically endangered sea turtles; green turtles, hawksbill turtles and loggerhead turtles. Bonaire’s beaches receive an annual average of 75 nests. For detailed information about the 2016 sea turtle nesting season on Bonaire, visit the STCB website’s nest monitoring page at http://www.bonaireturtles.org/wp/what-we-do/nest-monitoring/. Aruba is known as the “One Happy Island” for many reasons. The people are friendly, the beaches are immaculate and the average year round temperature is 82 degrees and sunny—perfect for all of the different adventures waiting for you around every corner of the island. Plus, the island is located outside of the hurricane belt so travel is ideal throughout the year! On Aruba, there is the perfect beach for every type of beachgoer. If you are looking for a quiet and peaceful beach outing, head to Baby Beach at the southern most tip of the island–the drive from our resorts will take about 45 minutes. 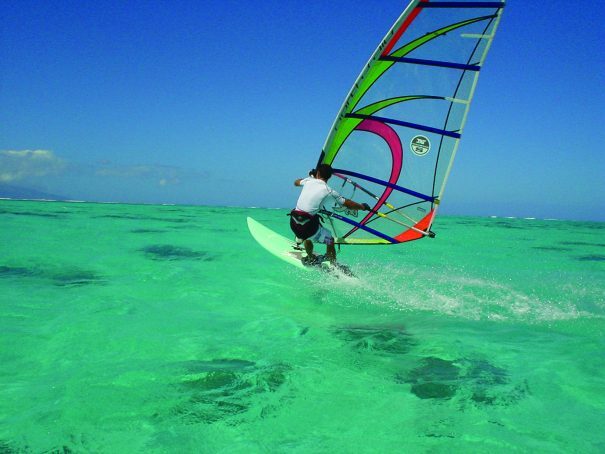 For the adventurous beachgoer looking for the perfect place to set sail, Fisherman’s Huts is a world renowned beach for wind sports and is home to the annual Hi-Winds Pro Am Windsurfing Competition. Arashi Beach is the best beach on the island for more advanced snorkeling. Those who brave a section of shallow wavy water will discover a vibrant reef close to the surface abundant with many different types of coral, angelfish, eels, parrotfish, tang, snapper, goatfish and squirrelfish – to name a few. Lastly, for the youngest beachgoers, the most family friendly beach on Aruba is Eagle Beach, with its famous powdery white sand and easy rolling waves. 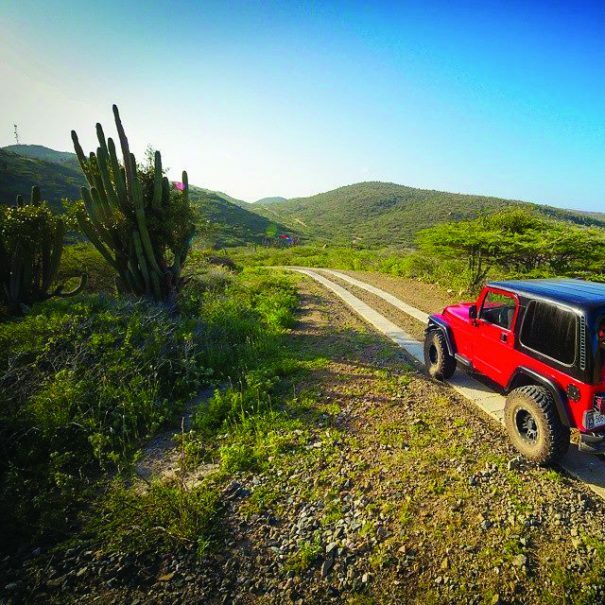 Those seeking a non-beach outing on Aruba have plenty of options ranging from a day of golf at the Links at Divi Aruba to an off-road Jeep adventure through the rugged Aruban countryside, or a sunset cruise aboard a catamaran complete with a fully stocked bar. Don’t forget to shop! There’s world class shopping all around the island ranging from high profile brands to local artisan treasures. For more information and to receive exclusive deals on island activities, stop by the Divi Vacation Stations in any Divi Resorts lobby. Food can tell you a lot about the culture of a country. When exploring Aruban cuisine, it is evident that Aruba is a “melting pot” of many different cultures and ingredients from around the world. However, at Divi Resorts our Regional Executive Chef Matt Boland is focusing on using fresh, local ingredients that are produced on the island. “Our seafood options like snapper, grouper, mahi mahi, and wahoo are purchased from local fisherman and aren’t out of the water for more than a few hours before they arrive on your plate,” he says. Chef Matt also purchases a wide variety of vegetables and herbs from island farmers. Supporting local farmers is something that he is passionate about. In his spare time, Chef Matt teaches members of the community how to build and manage small-scale greenhouses in the hopes of inspiring future farmers. The most refreshing complement to a day in the Aruban sun is a Balashi Beer–an easy drinking, thirst-quenching pilsner with a nice golden color and crisp tasting finish. Balashi Brewery has been brewing its premium, award-winning beer on Aruba since 1998 at their facility in Oranjestad. It is the only brewery in the Southern Caribbean, and the only brewery in the world that makes its beer out of desalinized ocean water. Stop by a Divi Resorts bar on Aruba and cool off with a Balashi Beer, or visit the Balashi Brewery and try it fresh off the production line! Brewery tours are held Monday through Friday. Call the Balashi Brewery at +297-585-8700 for more information. The official language of Aruba is Dutch, but the primary vernacular of almost all Arubans is Papiamento. Papiamento is a Creole language that has evolved from older languages including Portuguese, Spanish, Dutch and French. The name Papiamento is derived from the Portuguese word ‘papear’ which means ‘to jabber’. Con ta bai? How are you? Mi ta stimabo! I love you!